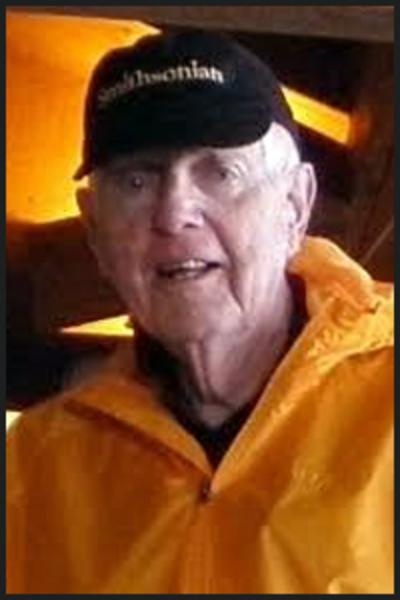 DOVER-FOXCROFT – Charles E. MacArthur passed away at Eastern Maine Medical Center, Bangor, Maine, on July 18, 2015 at the age of 87. He was born in Lewiston on April 26, 1928. Charlie graduated from Bates College in 1950 and served in the Navy during the Korean conflict as a Lieutenant JG aboard the U.S.S. Preston. He was the founder and President of Endacom Graphics in South Windsor, CT. Charlie was a pilot, a pioneering hot air balloonist, and a dedicated environmentalist. He founded the Alternative Vehicle Regatta, at Mount Washington, New Hampshire and the Ten Gallon 500, which were contests demonstrating alternative vehicles and fuel economy. He appeared on What’s My Line, To Tell the Truth, the Mike Douglas Show, and Good Morning America. He was featured in Yankee Magazine, among other publications, and was frequently interviewed on radio and television. In 1977, he purchased the hydro-powered Brown’s Mill in Dover-Foxcroft, where he developed a business hatchery and began a career as an alternative energy promoter. As owner and proprietor of the Dover Stove Company in Sangerville, he innovated with wood-burning technology. He invented the “TWERP,” a trash-to-energy incinerator which he installed internationally. He curated an alternative vehicle museum and authored The Adjustment, a cautionary tale about a post-petroleum world. Charlie was an accomplished photographer and world traveler. He worked tirelessly to educate the interested on environmental issues, particularly, in his later years, climate change. Charlie is predeceased by Anne Wilkinson MacArthur, his wife of 48 years. He is survived by his loving companion Sue Roy Humphries of Dover-Foxcroft, ME; daughter Deborah and husband Gary Michael Crakes of Cheshire, CT; son James and wife Susan MacArthur of Farmington, CT; daughter Carol and husband Walter Ansel of Mystic, CT; grandchildren Andrew Crakes of Rochester, NY, Jeffrey Crakes of Manchester, CT, Timothy Crakes of Hamden, CT, John MacArthur of Miami Beach, FL, J. Patrick MacArthur of Farmington, CT, Douglas Ansel of Los Angeles, CA, and Evelyn Ansel of New York City, NY; brother, David MacArthur and wife Sharon, of Venice Beach, FL. Charlie is lovingly remembered by Christopher Roy of Charleston, ME, Michelle and Gregory Zande, of Califon, NJ, and Ryan and Amanda Roy of Boca Raton, FL. A celebration of life will be held Saturday, August 22, 2015, at 10:30 a.m. at the Unitarian Universalist Church in Sangerville. In lieu of flowers, memorial donations may be made to 350.org, a non-profit concerned with global climate concerns. Contributions can be made online or sent to 350.org, 20 Jay St, Suite 732, Brooklyn, NY 11201.